MEINL HCS brass cymbals are made from MS63 alloy for a warm, harmonic, and balanced sound. This durable pack is designed with the beginner in mind to provide a well-balanced array of cymbal sizes that allows for sound exploration while developing skills. HCS series cymbals deliver consistent excellent tones with just the right amount of sustain. 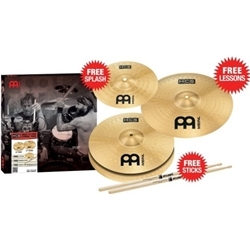 This value pack includes a FREE 10" splash, a FREE pair of Pro-Mark5A sticks, and a coupon code for three free lessons from Mike Johnston at mikeslessons.com.